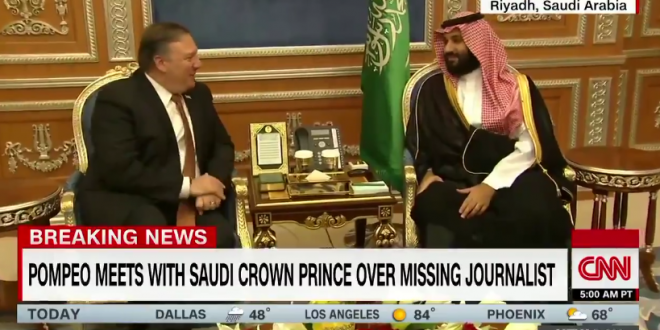 Mike Pompeo Meets With Saudi Arabia Royals [VIDEO] - Joe.My.God. Secretary of State Mike Pompeo met with Saudi King Salman in Riyadh on Tuesday to discuss the disappearance and alleged murder of journalist Jamal Khashoggi. President Donald Trump sent Pompeo to the kingdom where he will also meet and dine with Crown Prince Mohammed bin Salman, the country’s putative leader. As the secretary of state arrived in Riyadh, reports swirled that Saudi Arabia’s government is discussing a plan to admit that Khashoggi was killed after entering the Saudi consulate in Istanbul on Oct. 2. The Saudis are putting together an explanation that would absolve bin Salman of responsibility by giving him plausible deniability to say he didn’t order the killing and didn’t know about it, two individuals with knowledge of the situation told NBC News on Monday.